Since the early eighteenth century, following Peter the Great’s policy of forced westernization, translation in Russia has been a very visible and much-discussed practice. Generally perceived as an important service to the state and the nation, translation was also viewed as a high art, leading many Russian poets and writers to engage in literary translation in a serious and sustained manner. As a result, translations were generally regarded as an integral part of an author’s oeuvre and of Russian literature as a whole. This volume brings together Russian writings on translation from the mid-18th century until today and presents them in chronological order, providing valuable insights into the theory and practice of translation in Russia. Authored by some of Russia’s leading writers, such as Aleksandr Pushkin, Fedor Dostoevskii, Lev Tolstoi, Maksim Gorkii, and Anna Akhmatova, many of these texts are translated into English for the first time. They are accompanied by extensive annotation and biographical sketches of the authors, and reveal Russian translation discourse to be a sophisticated and often politicized exploration of Russian national identity, as well as the nature of the modern subject. Russian Writers on Translation fills a persistent gap in the literature on alternative translation traditions, highlighting the vibrant and intense culture of translation on Europe’s ‘periphery’. 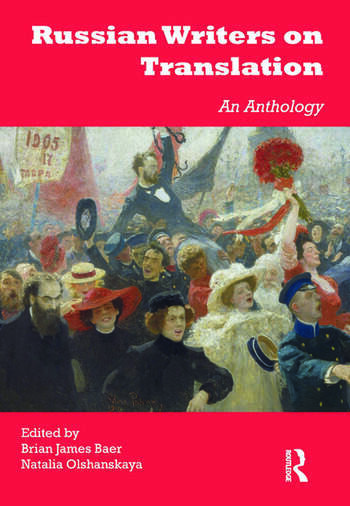 Viewed in a broad cultural context, the selected texts reflect a nuanced understanding of the Russian response to world literature and highlight the attempts of Russian writers to promote Russia as an all-inclusive cultural model. Brian James Baer is Professor of Russian and Translation Studies at Kent State University where he is a member of the Institute for Applied Linguistics. He is author of Other Russias: Homosexuality and the Crisis of Post-Soviet Identity (Palgrave 2009), co-editor of Beyond the Ivory Tower: Rethinking Translation Pedagogy (2003), editor of Contexts, Subtexts, Pretexts: Literary Translation in Eastern Europe and Russia (Benjamins 2011), founding editor of the journal Translation and Interpreting Studies, and general editor of the Kent State Scholarly Monograph Series in Translation Studies. Natalia Olshanskaya is Professor of Russian Language and Literature at Kenyon College, USA. She has taught courses in translation studies at the Odessa State University (Ukraine), at the University of St Andrews (Scotland), and at the College of William and Mary (Virginia, USA). She has worked as interpreter and translator, and has published numerous articles on the theory and practice of translation. In 2011 she received a Mellon research grant to pursue research on the translation of Roma literature in Soviet Russia.